Containers planted with small trees, shrubs and specimen plants make excellent focal points in a garden and what better way to start the garden this year but shopping for plants?! I’m a great believer in container gardening, bringing gardening and plants to anyone whether they have a large garden, back yard or a balcony. Not only can they be changed each season but also with careful planning a good container feature can be created on a budget, which will last a long time with a little maintenance, no wonder container gardening is fashionable at present. Obviously a good scheme relies on several factors: location, personal preference and budget. 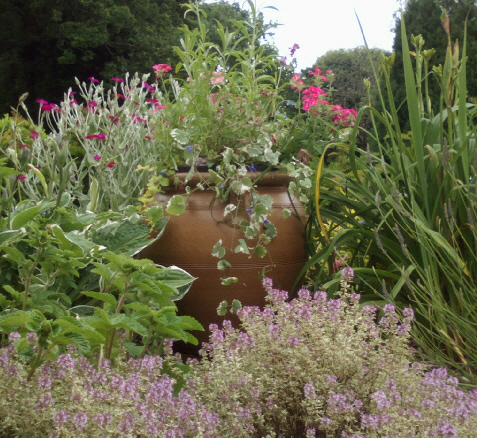 Start by choosing a container that you like, this can be terracotta, timber or stone effect. Don’t be afraid to use plastic mock-effect clay or timber pots as these are very convincing now and virtually indistinguishable from the real thing. Most containers are frost-resistant nowadays but do check. Choose the largest container you can successfully use, this will make them more stable when planted up as well as being able to accommodate more plants or if you prefer fewer but large plants. Also make sure that there are large drainage holes in the bottom of the container for adequate drainage. Containers and their plants are exposed to drought, frost and wet weather through the course of the year so the plants have a lot to put up with and need helping along. Choose a good compost that will last a long time and support the needs of growing and flowering plants, a soil based compost is ideal for containers as it retains it’s structure and requires less frequent watering during dry periods. Feeding the containers is very important. A liquid feed is ideal, as it will give the plants the nutrients they need as well as being cost effective. Other feeds in the form of slow-release granules are more convenient but cost more. Feed the containers through the summer months finishing in early autumn. It is also a good ideal to water containers in the cool of the evening so little water is lost through evaporation during warmer summer days. Once you have your container, know what compost to use and feed to keep the plants going strong then the last vital ingredient are the plants themselves. One good evergreen specimen per container is a great start; this plant will last all year round and can be complimented by bulbs in spring and bedding plants in summer. Add some trailing Ivy to the container and this can look very good. When creating planting schemes for gardens I have been known to spend ages in garden centres matching plants together and seeing how things will look, it’s a good way to see how a scheme will be in a garden. Doing the same for containers is great fun. Planted containers can be used not only is sunny sites but also shady positions or at an entrance such as a garden gate. It’s also possible to use a large container as a miniature water garden or if you want then a herb garden by the back door. Container gardening is very versatile as long as the plants have the right maintenance through the year. Choosing the right plants is a personal choice but with such a range at garden centres it’s a case of ‘mix and match’ until you find a scheme you really like, it’s the only time when shrubs, herbaceous and bedding plants, heathers, bulbs and rockery plants can be used closely together to make a great display that will last a long time for you to enjoy.